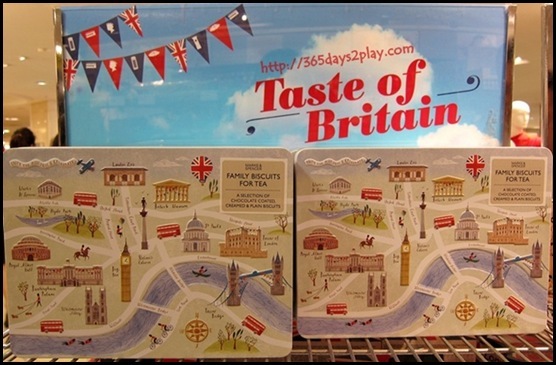 I don’t know about you, but I have a soft spot for all things British! I love the country, I love London, I love the quaint countryside, I love the British cooks (Nigella, Jamie, Hugh Fearnley). Three times I’ve been to the UK for holidays, and I still yearn to go back again. I have also been to New Zealand 3 times, and next week will be the 4th trip. But I always tell the kiwi Partner that the grass in England is greener. Serious! Did you manage to catch the Queen’s Diamond Jubilee on TV? My parents were glued to the TV even until past midnight! Such is the fascination for the British Royal family, who aren’t related to us in any way! The Partner likes to tell me that he has royal blood, but what’s the use of that if he can’t show me my room in the castle? 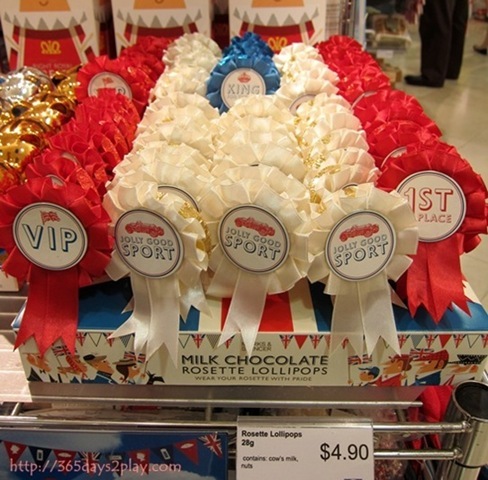 Anyway, one place in Singapore you can indulge in a bit of British is at Marks & Spencer. I love it when it’s Easter and Christmas. All their goodies are packaged so nicely and always so festive looking. 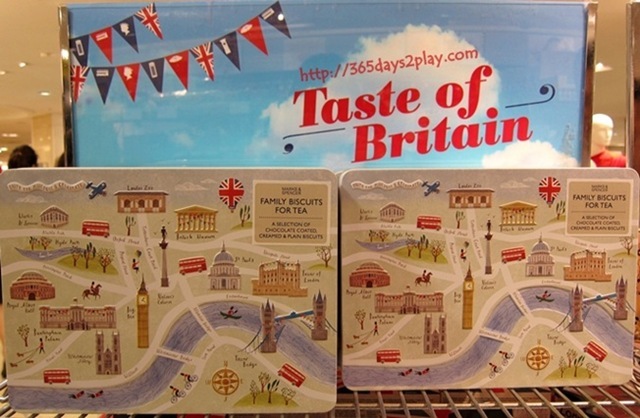 This time round, thanks to the Queen’s Jubilee and the upcoming London Olympics, Marks & Spencer has also churned out quite a few new British treats. These Family biscuits for tea were going at $37. My GUY friend was lusting over these tins for the last 1 week and he finally succumbed to buying one today. It certainly is a pretty tin but is it worth $37? Something cheaper if you still want to buy something. Milk Chocolate Rosette Lollipops. Great fun for wearing too. Like so.